We know that green is a big watchword in the tech market, and if you team that up with a fully functional laptop you might just have a winning combination. 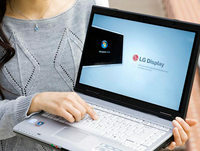 True, it’s a 14.1 inch LG notebook rather than a netbook (hey three buzzwords would rule) but it’s supposed to reduce power consumption by 75% with integral panels that can switch from reflective mode (outdoors) to transmissive (indoors and night). A touch of a button lets you adjust this easily, so there’s no faffing around with complicated menus. This makes it more energy efficient as well as addressing visibility issues such as the sun reflecting off the screen., They’ve given it a contrast ratio of 9:1 so it should be 100% viewable in reflective mode. Not only does this mean battery life will last longer, but you should also save on your electric bill. We can look forward to seeing this at CES so watch this space for a video. Would you tweet your plane crash?